Pinkie Pie can have fabulous, fashionable fun on land and in Seaquestria! Inspired by the My Little Pony the Movie, this 3-inch Pinkie Pie seapony figure has a beautiful mermaid-like tail with a stylish, colorful design and cutie mark on her back fin. 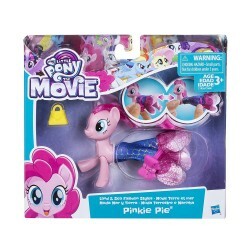 Pinch the clip and slide the tail towards her head to reveal the Pinkie Pie figure in pony form! Imagine movie-inspired adventures with My Little Pony friends (Each sold separately. Subject to availability).